Shell-shocked soldiers to whom Preston taught basket-weaving at the Seale-Hayne Neurological Military Hospital, Devonshire (UK). Preston is just out of camera to the right, but her black Scottish Terrier ‘Little Jim” can be seen sitting next to her in the bottom right-hand corner. After the 1914-18 war, Margaret Preston lived and created artworks in Mosman. During the war, Margaret and friend Gladys Reynell got the chance to help rebuild shattered lives. Margaret Rose Preston (nee. McPherson) was born on 29 April 1875. She began training as a traditional artist in Sydney at age 9. In 1893 she enrolled at the National Gallery’s art school in Melbourne, under Frederick McCubbin. McCubbin had a close association with Tom Roberts and the Heidelburg School. Roberts and other Australian Impressionists set up and painted at Camp Curlew. Margaret McPherson left Australia in 1904. She travelled with hometown friend and fellow artist Gladys Reynell. They absorbed European culture and studied contemporary art trends. Like so many artists and theorists of the time, she developed fascination for Japonisme. She studied decorative arts and traditional design at the Musée Guimet, the Louvre, and the Victoria & Albert Museums. Of particular interest to her were the woodblock Ukiyo-e masterworks. Margaret and Gladys, based in England after the invasion of France, continued to practice, study and teach. In 1915 Margaret, Gladys and 21 students went on a field trip to Ireland. She painted Still life with teapot and Daisies by the sea at Bunmahon, County Waterford. Ukiyo-e influences are present in the placement of objects and spacial flattening. The painting’s warm pastel tones seem to defy the storm clouds of industrialized Armageddon in Europe. The light, cheery seaside setting completely contrasts with Otto Dix’s nightmarish depictions. 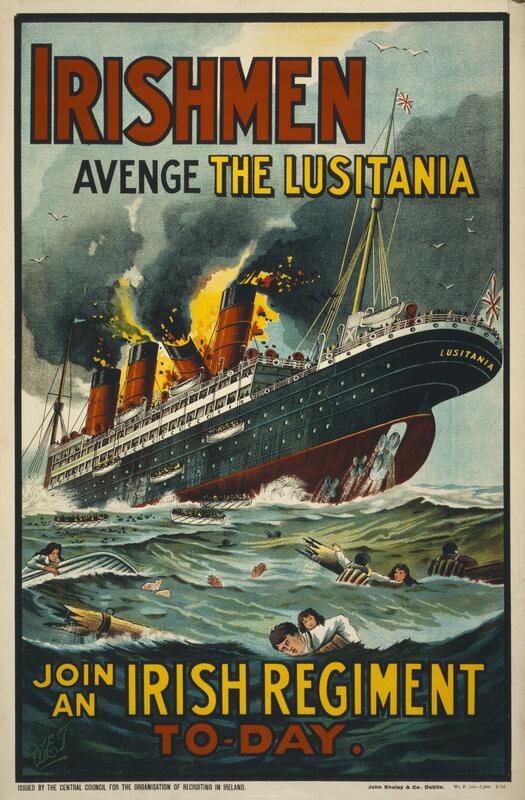 U-boats lurking off the coast and the sinking of the Lusitania confined Margaret and Gladys to England. In 1916 they enrolled at the Camberwell School of Arts and Crafts. Here they studied pottery, basket weaving, printmaking, fabric printing and dyeing. ‘Beaker 1917’ made by Gladys Reynell depicting Margaret’s dog ‘Little Jim’ and neighborhood cat. Carew Reynell’s widow sent Gladys a gift of local S.A. clay for her pottery. Gladys’ family were doing their bit. Carew Reynell manager of ‘Reynella’ winery3, enlisted as an officer with the 9th Australian Light Horse. The family was emotionally devastated after his death at Gallipoli. Walter Rupert Reynell, Rhodes Scholar and Neurologist worked with shell-shocked soldiers. Gladys’s younger sister, Emily was a volunteer nurse. Thousands of soldiers were sent back to Britain with shell-shock. Dr. William Halse Rivers advocated a humane treatment program based on ‘talking cures’ and educating the patient. A far more enlightened approach than the electric shock ‘therapies’ administered at other facilities. He believed in creating a highly charged and positive atmosphere in which hysterical patients would see recovery occurring in others around them. Dr Hurst was a great showman and made countless claims as to his ability to cure the symptoms of hysteria. The expectation that a patient would receive a miracle cure was drummed into him from the moment he arrived at the hospital…Preparation might take several days and the nurses would have a vital role to play in explaining to the patient beforehand how wonderful the effects of the treatment would be. On the day of the treatment, the build-up to meeting the doctor turned the encounter into almost a religious experience. At Seale Hayne, a series of films were made to record the success of Hurst’s techniques. 25-35 men would arrive every few weeks to the Hospital. These the various doctors would bring down to the shed known as the Pottery. The work was under the strict supervision. This was to aid them to regain confidence in their own abilities as well as to interest them while they were waiting for their cures. 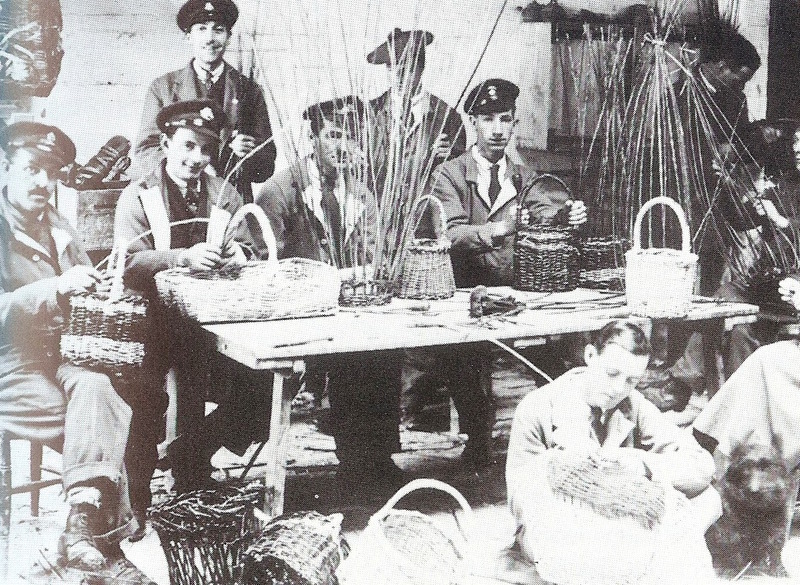 Some of the shell-shocked soldiers to whom Preston taught basket-weaving at the Seale-Hayne Neurological Military Hospital, Devonshire (UK). Preston is just out of camera to the right, but her black Scottish Terrier ‘Little Jim” can be seen sitting next to her in the bottom right-hand corner. When these baskets were sold to the local housewives of Newton Abbott (the nearest town), some of the women complained that the baskets “started to shoot” on shopping expeditions, and were a little conspicuous; but it was pointed out to them that these were really “war baskets,” so no money had to be given back…. This craft helped cure in many ways. For one thing, it gave an easy and interesting occupation. For another, it restored confidence, when the patient found that he could make things that his doctor could not. Again, it gave healthy exercise and allowed the brain to work out original ideas and put them into practice. Perhaps the great thing was, that, at the end of the labour, the patient possessed an object that even the doctors wanted, and that he could raise money on if he so wished. It was found that amongst the patients were bricklayers, who were capable, under strict supervision, of laying the bricks. This was done from a simple plan of a small brick kiln, of the kind generally used as an experimental one for brick factories. Drawings of kiln construction from McPherson’s sketchbook 1917. Margret Preston Papers. Art Gallery NSW. Memory goes back to one poor “Tommy” who had decided that his hands could not move. When they were gently “pushed” into this mud, he quickly decided to pull them out and use them on the “pusher,” who was myself. The doctor rushed to the rescue and took away a soldier who had been partly cured of a difficult complex. One soldier would turn the handle, while another threw on the wheel. It would hardly seem possible that turning a wheel would start a cure in a case of badly shaking nerves, but this happened. They were shown how to make objects by winding sausages of clay together. Some of these men produced fantastic animals and grim creatures that would have turned Dali green with envy. This meant long walks on the moors, looking for plants that would give dyes… These were brought back to the shed, cooked in jam tins, and later fixed ..Thus the dye would not come out of the cloth when it was washed. everything that could be made to do was used. Cigar-box lids, old pieces of furniture that could be cut into shapes; any wood that had a fine grain. Paint would be rubbed on an old tray with a photographer’s squeegee, and then over the upstanding design of the wood. A piece of dampened paper would be put on this, and rolled over with a clean roller. The paper was taken off, and the results shown around for criticism. as they caused no excessive expenditure of energy. … Many made Christmas Cards this way. The cards were, of course, unique, as it is only possible to get one copy by this method. All the crafts are better than that horrible work known as crewel work. The most pathetic thing was to see a big wounded soldier plugging away in crewels at the motto, “God Bless our Happy Home,” which was often to be seen in the war hospitals. remind[ing] their owners of the pottery shed at Seale Hayne Hospital on the Devon moors. William George Preston was a 2nd Lieutenant in the Australian Artillery. He met Margaret McPherson in London and proposed to her en route to Australia. Margaret and Gladys held a joint pottery exhibition in Adelaide in September 1919 which included pottery from the Seale Hayne Hospital. Margaret married George Preston on the 31/12/1919 in Adelaide. The reception was held at ‘Reynella’, the Reynell family home. George resumed his position as manager of Dalton Bros. Ltd. Later at Anthony Hordern &Sons his overseas imports included Japanese textiles. The Prestons moved to ‘Preston’, 11 Park Ave., Mosman in 1922 where they lived for 10 years. ‘Flowers, 1917’ oil on board oil on board 46.0 h x 54.7 w cm National Gallery of Australia. Note the use of ‘Japanese’ colours and corresponding scales applied to final picture. Still Life, 1925 is a good example of Preston’s evolution from academic realism to oriental inspired modernism. Preston’s adaptation of Japanese prints in Edward F Strange’s ‘Japanese colour prints’, 2nd ed., 1908. AGNSW Archive Photographer Chilin Gien for the AGNSW. Preston’s sense of place was also represented through the urban landscape. Prestons later works ventured beyond her main subject matter of still life and landscape. Japanese submarine exhibition depicts the wreckage of the mini-sub recovered from Taylor’s Bay. She and George were disturbed by the internment of acquaintances and the denouncement of neighbour Ken Prior, as a Japanese agent.19 Her concerns about censorship and cultural xenophobia came through in Tank traps and General Post Office. The drapers shop to the right of the Post Office on Rowe St. references the tailors dummies. Most of her significant works can be viewed online at the Art Gallery NSW, National Gallery and National Gallery of Victoria. The Mosman Art Gallery also holds some of Preston’s works. Its exhibition Tokkotai: Contemporary Australian and Japanese Artists on war and the Battle of Sydney Harbour commemorated the 75th anniversary of the Midget Sub sinking. 2 Preston, Margaret From Eggs to Electrolux Art in Australia; No 22, Dec. 1927, p.25. 16 Ibid. McQueen, Humphrey p182. Butler, Roger, Preston, Margaret, 1875-1963 and National Gallery of Australia The prints of Margaret Preston : a catalogue raisonné (Rev. and enlarged ed). National Gallery of Australia, Canberra, 2005. Edwards, Deborah, Peel, Rosemary and Mimmocchi, Denise Margaret Preston (New ed). Thames & Hudson, Fishermans Bend, Vic, 2010. Harding, Lesley Margaret Preston: recipes for food and art [Carlton, Victoria] The Miegunyah Press, and imprint of Melbourne University Publishing, 2016. This is an article from Art in Australia, November 15th, 1939 entitled Crafts That Aid. Preston notes that it is ‘partly reminiscent and partly it deals with the immediate future.’ (The Second World War had just started.) Having experienced the effects of war she realised that ‘the moment to prepare for such work’ had, unfortunately, come again. Mrs. Preston is one of Australia’s leading artists, and she can talk interestingly about the crafts she practises. A few months ago, under the auspices of the Carnegie Institute, she gave a series of lectures at the National Art Gallery of New South Wales. These proved highly genial and entertaining. The subject-matter included many aspects of art, such as the preservation of oil paintings and the best way of printing woodcuts. Mrs. Preston touched briefly then on the use of various crafts in war-time. The present article amplifies those remarks. THIS article is a personal one. It is partly reminiscent and partly it deals with the immediate future. In 1916, British shell-shocked and injured soldiers started pouring into England. This necessitated hospitals that were fitted to deal with their maladies. Many cases, such as those with shock to the nerves and with injured limbs had long intervals between the various times when they were seen by the doctors and by the administration. This circumstance demanded the services of persons who were able to interest the men, and to aid the doctors in ways that did not come under the heading of “nursing.” Some of this work took the form of handicrafts. My own experience was gained in a shell-shock hospital situated on Dartmoor, England. The building had been an agricultural college, and it was requisitioned by the Government for the use of soldiers suffering from nerve trouble. This was the main object of the hospital, but there were also cases of twisted hands and stiffened limbs that had to be treated. The hospital was for the rank and file, and not for officers. The men would arrive in fortnightly batches from the war areas. My work was to take from twenty-five to thirty men every two or three weeks. These the various doctors would bring down to the shed known as the Pottery. This outhouse was originally the dairy of the agricultural college. The work was under the strict supervision of the doctors. It consisted of basket-making for twisted and stiffened hands; of pottery for the shell-shocked men. This was to aid them to regain confidence in their own abilities as well as to interest them while they were waiting for their cures. There were others who came to the shed with complaints that allowed them only to amuse themselves. These did monotypes, batik, and other handicrafts. Perhaps the most valuable of them all was basket-making. This simple craft has the greatest right of all the handicrafts to the name, as it is about the only one that cannot be carried on by machinery. The great help that basket-making gives to twisted hands and stiff arms is now acknowledged by doctors who have worked in war hospitals. Pulling of the canes and holding and separating the rods used muscles and fingers that had become stiff and hard. Another thing that helped was the simplicity of the craft. It did not worry tired brains, and took very little concentration to obtain a good result. These facts place basket-making well on the way to being one of the most useful of the handicrafts for war-time work. As regards the materials for this work, only a few tools are necessary — a basket-maker’s bodkin, a pair of sharp shears, a picking knife, and a basket-maker’s iron for knocking the cane together. For a simple basket, two kinds of rods are employed. Some of these are young and pliable. The others are older branches, known as “sticks.” For larger baskets, stronger canes and a different method are used, but it can be seen how the hands are used in manipulating the sticks. The pulling and stretching of the fingers all help in the recovery of lost suppleness. It is suggested here that lessons could be taken from the blind, so that when a time comes there will be found persons who will be able to help when necessary. At the hospital on Dartmoor, some of the men went on to advanced lessons in this craft. They are now earning their living making fish and clothes baskets, which take strong hands and careful work. Next to basket-making, pottery work was of the greatest assistance. This craft helped cure in many ways. For one thing, it gave an easy and interesting occupation. For another, it restored confidence, when the patient found that he could make things that his doctor could not. Again, it gave healthy exercise and allowed the brain to work out original ideas and put them into practice. Perhaps the great thing was, that, at the end of the labour, the patient possessed an object that even the doctors wanted, and that he could raise money on if he so wished. The method of making pottery by these shell-shocked men was simple in the extreme and had no connection with public money making. As the hospital was out on the moors, there was no gas or electricity for firing. There was no factory at which to buy ready prepared clay, and there were no shops to run to when the glaze supplied failed. It was a self-made affair from beginning to end. The first thing that had to be seen to was the making of a kiln. It was found that amongst the patients were bricklayers, who were capable, under strict supervision, of laying the bricks. This was done from a simple plan of a small brick kiln, of the kind generally used as an experimental one for brick factories. It had been proved quite successful in Cornwall, where I had worked with my friend Gladys Reynell. After the kiln was built, the next thing was to get the clay. This meant that all the patients who could walk would carry pieces of sacking or bags and shovels. As the hospital was in Devon, the finding of clay was no bother. (By the way, there is plenty of rough clay in our Australian ranges not suitable for commercial pottery perhaps, but quite useful for amateur work). At the end of the walk, the men would hump the clay on their backs, and then go back to the shed. Sometimes when the men were not able to carry the clay, a cart and horse would be begged from the farmer nearby, but generally we humped it back ourselves. When the clay arrived at the shed it was thrown into an old wooden tub and covered with water. The next day it was stirred by hands that needed such gentle treatment as the pressing together of some such substance as liquid mud. Memory goes back to one poor “Tommy” who had decided that his hands could not move. When they were gently “pushed” into this mud, he quickly decided to pull them out and use them on the “pusher,” who was myself. The doctor rushed to the rescue and took away a soldier who had been partly cured of a difficult complex. After the men had mixed the mud and water to the consistency of a very thick cream, they scrubbed it through three different meshes (sieves). This left all the stones and rubbish in the sieves to be thrown away. The clean clay was then put into bags and hung in the sun to allow the water to drip out. After some days it was brought into the pottery shed and put on a table, where it was beaten and thrashed to get all the air out, and to set the clay in a fine smooth mass for work. Then the wheel had to be made, and the wheel was as primitive as the rest of the materials. It consisted of an iron shaft with a circular flat piece of iron attached to the top. This shaft had another length of iron joined to it half-way. The iron had a handle at its free end, which turned the shaft round and so revolved the circular plate at the top. The whole was enclosed in a box, which had a shelf and ledges that held the clay ready for throwing. One soldier would turn the handle, while another threw on the wheel. It would hardly seem possible that turning a wheel would start a cure in a case of badly shaking nerves, but this happened. Many doctors visited the pottery shed either to see their patients, or to study how the scheme worked. There were also different visitors. Amongst these was John Galsworthy, who edited a kind of shell-shock paper. When Galsworthy’s visit was expected, the most shaking patient was put on to turn the wheel. This man had been for two years a martyr to the most convulsive shaking. It was discovered that he had one decided trait —an extreme personal vanity. When Galsworthy arrived with secretary and photographer complete, this patient was asked to try and keep still, and to look at a new pair of silk laces that had been put in his shoes. He did so, exercising a tremendous will so that the photograph should not be a failure. His doctor counted the seconds that became minutes, and another patient was taken away, well on the road to a cure that later became permanent. This man’s work is now in the War Museum in London. Many men did not like throwing on the wheel. They were shown how to make objects by winding sausages of clay together. Some of these men produced fantastic animals and grim creatures that would have turned Dali green with envy. The doctors found these efforts interesting, and would try to get the men to part with them, but none of them would do so. They are to be found in unexpected places, such as miners’ homes and policemen’s barracks, where they remind their owners of the pottery shed at Seale Hayne Hospital on the Devon moors. Other crafts interested the men. One was simple dyeing. This meant long walks on the moors, looking for plants that would give dyes. Sorrel was found to give a yellow, and the bulbs of the white iris a good black. These were brought back to the shed, cooked in jam tins, and later fixed with a mordant of common salt, alum, or some simple chemical. Thus the dye would not come out of the cloth when it was washed. Dyeing was used in conjunction with batik work. A piece of unbleached calico would have a simple design drawn on it. This was retraced with hot wax, which was contained in tins that had lips to them. These were kept liquid over methylated spirit stoves. When the design had been waxed, the cloth was put into the boiling dye for a few minutes; then taken out and washed with soap and water. Any wax left on was scraped off with a knife. Cushion covers were generally the greatest extent of our ambitions. Wood-cutting was another craft that helped things along. There being no money for anything, everything that could be made to do was used. Cigar-box lids, old pieces of furniture that could be cut into shapes; any wood that had a fine grain – all was gratefully accepted. The paint would be rubbed on an old tray with a photographer’s squeegee, and then over the upstanding design of the wood. A piece of dampened paper would be put on this, and rolled over with a clean roller. The paper was taken off, and the results shown around for criticism. Monotypes were also popular, as they caused no excessive expenditure of energy. This craft was done with a small piece of plate glass, zinc or copper, a soft hair brush, a roller, a rag, and some blotting paper. The worker began by rubbing a little oil and paint on to the glass. This he tried to get fairly even. Then he drew his design on to this, wiping out the white parts to be, and the highlights with the rag. Then he quickly placed a piece of paper on this drawing, rolled it over with his roller, and pulled it off the face of the glass. Many made Christmas Cards this way. The cards were of course unique, as it is only possible to get one copy by this method. Then there were other crafts to interest the men. Stencilling was one. All the crafts are better than that horrible work known as crewel [embroidery] work. The most pathetic thing was to see a big wounded soldier plugging away in crewels at the motto, “God Bless our Happy Home,” which was often to be seen in the war hospitals. This is an article on “crafts that help.” It is the moment to prepare for such work. As this is a personal article, it is not out of place to give advice on such matters. The Arts and Crafts Society are the people to be consulted. In New South Wales, Miss Florence Sulman, the president of this society, is always willing to help. She is extremely competent to do so. Great article , just one tiny point the losation of Bonmahon is in Co. Waterford not Wexford , not a huge problem but just for accuracy ! Thought you would like to be corrected. Yes, thanks for that! Hope you found this article interesting.